Médecins du Monde welcomes the report of the UN independent Commission of Inquiry (CoI) and joins the general condemnation of violence against civilians and in particular that aimed against women, elderly people, children, persons with disabilities, journalists, and healthcare workers. Since the beginning of the demonstrations in March last year, MDM has been witnessing first-hand the evident severe impact of the use of live ammunition against civilians and health workers. Almost 7000 injured civilians have challenged the already weakened health system, stretching it to its limits. A large number of them are part of the over 9’000 people currently waiting for surgical care, with 1200 of them at risk of developing osteomyelitis. This is only one aspect that reflects the massive influx of trauma casualties. Only 20% of those requiring complex surgeries, exclusively available outside of Gaza, have been allowed to exit the strip. Those who have survived very often have to endure life-long consequences of handicap. In this context, MDM is also witness of the impact of those disabilities on mental health, as well as of the psychological consequences of all the traumatic experiences of lethal violence Palestinians are exposed to, especially children. Worried by the unparalleled number of direct attacks against healthcare workers in Gaza, MDM drafted a public report analysing the particular vulnerability of Palestinian health NGOs. This report was shared with the Commission of Inquiry. 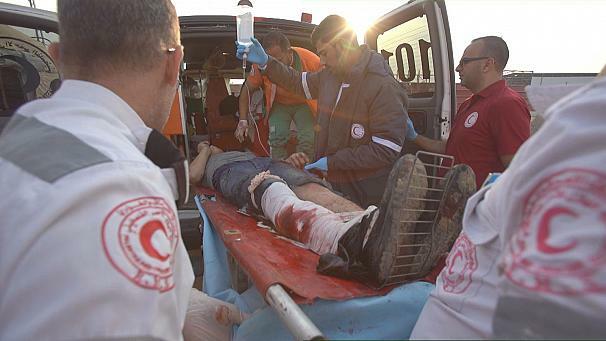 In this report, MDM observes that Palestinian health NGOs face unprecedented levels of violence against its personnel, structures and ambulances. These attacks and the death of their colleagues have also left strong psychological scars. Beyond the atrocious violations of international law, the impact of these violations is difficult to quantify or measure through the untold stories of those who died or suffer serious life-long consequences because those who were supposed to help were killed or incapacitated. MDM takes thus this opportunity to remind all actors that attacks on healthcare workers, structures and ambulances should never occur: neither in times of peace nor in times of war. They represent serious violations of IHL and IHRL. Condemn all attacks against healthcare personnel, structures and ambulances, and to promote awareness on the importance of their protection. Ensure all violations against healthcare are investigated and hold all perpetrators accountable for the unlawful use of force. Guarantee that all healthcare services and personnel are protected. Remind Israel of its obligation as an occupying force to ensure that the Palestinian population has access to proper medical services and that any obstruction to this right represents a violation of IHL; this includes the free, unimpeded and timely movement of patients and medical staff out of Gaza. Finally, MDM urges to tackle the root cause, calling for the immediate and unconditional end to the blockade and the closure of the Gaza Strip.